“Right Fit Wrong Shoe’ by Varsha Dixit is the usual story of quite an unusual girl Nandini – who thinks with her heart and loves with her head. 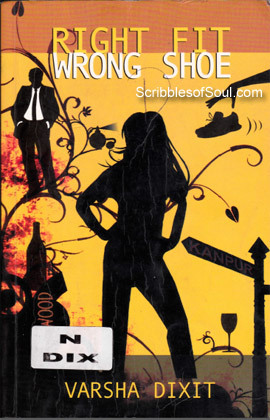 And, this unique cross-connection of muddled up emotions of a workaholic creative supervisor, results in a young, vivacious, feel-good novel bubbling with humour, sarcasm and witty one liners, with a heady drama being played in the background. When I began reading this novel, I felt that it was just another coming-of-age story of a small town girl desperately trying to act modern in a highly competitive working environment, struggling with lecherous colleagues and stone-hearted, impossible-to-please Boss. Truly speaking, I was a little apprehensive about anything new or exciting in this book. However, as the story progressed, all my initial misgivings evaporated and the debut attempt by Varsha Dixit delighted me with its novel approach towards a conventional love story. Here, the novel begins where most love stories end. In the initial few pages, Nandini is introduced as a young, bubbly girl, whose world is brimming with interesting work, great friends and loving parents. But, in a while, it becomes evident that all is not well with her life. Despite all her liveliness, there is a dark secret of her past looming around. Apparently, she has suffered a heart-break in not-so-distant past and still feels guilty about leaving her boyfriend in an unjustified way. Soon, the man in question, Aditya Sarin makes a grand entry as the new boss and owner of Nandini’s company. Aditya, with his good looks seems to be the perfect dark, tall, handsome man, every woman dreams of and the suspense as to why Nandini left him, pinched me again and again. But, as a die-hard romantic, I fervently hoped for rekindling of love between the estranged couple. However, as is usual in any good drama, nothing sweet can happen unless the Hero and the Heroine swallow all the bitter pills. So, in keeping with the tradition, the chocolate-faced romantic Hero appeared in the guise of an angry young man, whose ego was brutally bruised by his Lady Love’s betrayal and he is now hell bent on taking revenge. Like Nandini, I was also perturbed at this unwarranted storm rising in her life, and before I could check myself, I was drawn into Nandini’s world as Varsha lavished heady details of her delectable past. And, I was smitten with the unique charm of this exotic continental dish, Varsha has conjured with her curious mix of spicy style and effective narration. Though, the story is nothing new, but it is author’s animated, spunky style of writing that makes the book really come alive. She makes her characters talk in an informal, day-to-day lingo with heavy inputs of Hindi words. Though, at times, I was baffled with her liberal use of strange acronyms. Yet, her gripping narrative kept the flow of story easy and interesting. The story is set in Kanpur, and true to the setting, Varsha has perked up Nandini with a perfect blend of modern and traditional values. Her small town inhibitions add a definite charm to this racy love story. Be it the frank conversation between intimate friends or the friendly banter of love-struck couple, there was an ease in the conversational flow that could not leave the reader unaffected. Before I could even realize, I was desperately hoping for the two lovers to unite, appreciating Aditya’s golden heart hidden behind his tough yet appealing exterior and sympathizing with the long suffering, self-evasive noble dame, Nandini. The novel delighted me as a sweet romance, minus any villains, coming across as a dream-come-true love story. The writer’s penchant for lending Hindi movies names to the chapters also lent a very filmi character to the whole novel. I would definitely love to see this novel being converted into a full length movie or for that matter, a long running soap opera. In short, I found nothing wrong with either the fit or the shoe. The romantic debut fits Varsha Dixit as snugly as a glass sandal to Cinderella. This desi version of Mills and Boons is definitely worth a read!